Seattle’s issues with homelessness have been going on for a long time. According to one source, Seattle trails only New York City and Los Angeles for the number of people who are homeless. Not surprisingly, this has led to a number of concerns, conflicts, and even some very strange antics, many of which NPQ has covered in the past. The latest is a battle between one of the small-building villages where people who are homeless have been living and the nonprofit organization that supervises the initiative. Nickelsville has three communities in the Seattle area, villages that are self-managed by the 150 or more homeless people who live in them. The first was created in 2008 following a series of sweeps by then-mayor Greg Nickels, after whom the villages are named. The concept of camps or villages with this kind of self-governance has grown in the Seattle area. Others, like SHARE, use a similar model and a study by the city’s Department of Human Services in 2017 suggests that the model works well and has been more successful in transitioning people out of homelessness than other efforts. Although the villages started out by simply setting up in unused property, they are now licensed by the city and involve a case management model that is overseen by a nonprofit partner, the Low Income Housing Institute, or LIHI. It is essentially a three-way partnership, then, between the Department of Human Services, Nickelsville, and LIHI, and this is where the conflict has arisen. According to a report at Real Change News, LIHI and the villages are required by Human Services to have a memorandum of understanding outlining their agreement and how services will be managed. Sharon Lee, executive director of LIHI, is quoted as saying that the MOU is required in order to “ensure fairness” and to meet the expectations required in the Human Services funding. However, wording in the latest MOU draft would essentially give LIHI the right to determine who is allowed into Nickelsville, which leaders of the village believe would undermine the self-governance that is at the core of the model. There was supposed to be a meeting between LIHI and Nickelsville on March 8th, the day the permits for the village expired, but that did not happen. 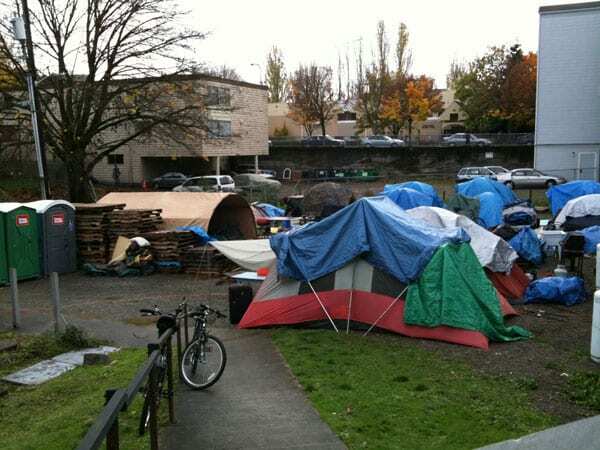 It is not clear if there is a direct connection, but there has been a series of escalating arguments and discussions about the homeless issue in Seattle, and this might be part of that bigger battle. As reported by NPQ, a tax on the wealthiest companies in the city was levied by the city of Seattle. Known as the Amazon tax, it was an effort to generate funds to address homelessness from the very companies whose presence has helped to drive up the cost of living which has then added to the number of people who are homeless. (The Dept. of Human Services website has some data on this.) Almost as soon as it was passed, the tax was repealed. Only two people on the City Council voted against the repeal, one of whom was Kshama Sawant. Sawant has been vocal in her challenges to the current mayor’s nominee to head the Department of Human Services. In an open letter, she chides Mayor Durkan for nominating current interim director Jason Johnson without input from the community or the City Council and, in fact, ignoring the many calls for him not to receive the nomination. Just a few days earlier, for example, representatives of the homeless village SHARE testified against Johnson’s nomination. In seeming retaliation, it was announced that the city would withdraw its support of SHARE at the end of June 2019.